I was recently sent the new Kashi Granola and Seed Bars to try. They come in two flavors: chocolate chip chia and honey oat flax. I enjoyed trying both of these flavors. Each package comes with two crunchy bars in it. I tried the chocolate chip chia first and split the pack with my husband. We both liked them a lot. They are similar to other crunchy oat bars and the addition of the fiber and omega-3 rich chia seeds was great. These bars come from Battle Creek, MI from Kellogg. I have actually toured the Kellogg plant as part of a dietetics class trip which was awesome. I like that you can choose to have 1 or 2 of these bars at a time. If you only have one, it is quite a light snack. These are also awesome topped with peanut butter. The honey oat flax bars contain flax seeds, quinoa and whole grains. Both flavors of bars have 320 mg ALA omega-3 and 3 grams of fiber. These can be found in most grocery stores and retail for about $3.99 per box. 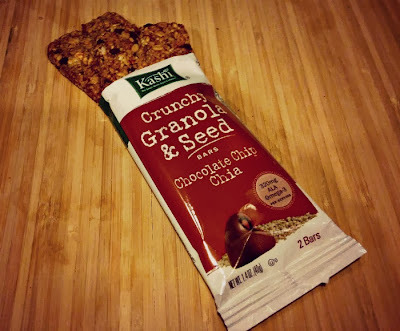 I enjoyed trying these Kashi granola and seed bars. I am a fan of other Kashi products; especially their Kashi Go Lean cereal which is filled with protein, fiber and whole grains for only 160 calories. Kashi products can be included as part of a healthy diet to help meet your fiber and whole grain needs. I normally eat a pretty healthy diet but I got a little off track with the holidays and am trying to get back on track. How I do this is by making smart choices by eating a lot of vegetables, fruits, whole grains and lean proteins. One of my main goals for myself is to not stop eating related to boredom. A lot of times, I will snack many times through the day at work not because I am hungry but because I am bored. By choosing healthy, filling foods, I am trying to get back on track to feeling my best.